In our mikulov MARCUS winery we produce only high quality wines in limited series, 1000 - 3000 bottles of one variety and the wine route. The maximum production is 20 -30 thousand bottles. We process varieties of Rhine Riesling, Gewurztraminer, Chardonnay, Pinot Blanc, Cabernet Sauvignon, Pinot Noir, and Frankovka from our own integrated production. Our wines are processed with the greatest care and love and we place an emphasis on eco-natural approach to the grapes and the vineyard. In order for the wine to reach a large extract and power, we let only one raisin grow on the bush. Moreover our vineyards have the advantage of double sunshine caused by reflection of the sun ray from the surface of the greatest Moravian lake. All green work is performed manually. When we produce wine we use the most advanced technology, cider is processed by using the method of controlled fermentation, to obtain a fullness and a significant bouquet of the wines. In the vintage we are giving rise to different parts of the same variety, the most for Rhine Riesling, because of the time of gathering grapes, the diversity of their maturity, but also the used technological procedures, which we try to constantly innovate in accordance with the latest findings. MARCUS winery does not win awards only in Czech Republic, but also in the whole world. Grapes are picked exclusively by hand, then putted in baskets, so they dont wrinkle, do not damage the peel so they won't oxidize before pressing. The grapes for clarets are not milled, although at the expense of lower moldability, but it prevents the formation of bitter tones in the wine. The grapes are pressed within 1-2 h after being collected with gentle pneumatic press. These measures may reduce yield, but improve the quality of the wines - high extarction, roundness, support a distinctive aroma - the bouquet and retain the characteristic variety. At the present time in some of the varieties we're going to cryomaceration. Stalked grapes to get hypothermia at 2°C and leave at very low temperatures belong 1 day before the wad to highlight the aroma. The stum after pressing and its contents, is checked by the confidant designated by the State agricultural inspection, which at the same time verifying and certifying the origin of the grapes from the declared vineyards, which are registered with the Central control and test agricultural institute. For the approval of wines in a given word in its final form, when it comes to the bottle, must pass on several of the analyses and the approval of the State agricultural food inspection authority, which assesses more qualitative terms. 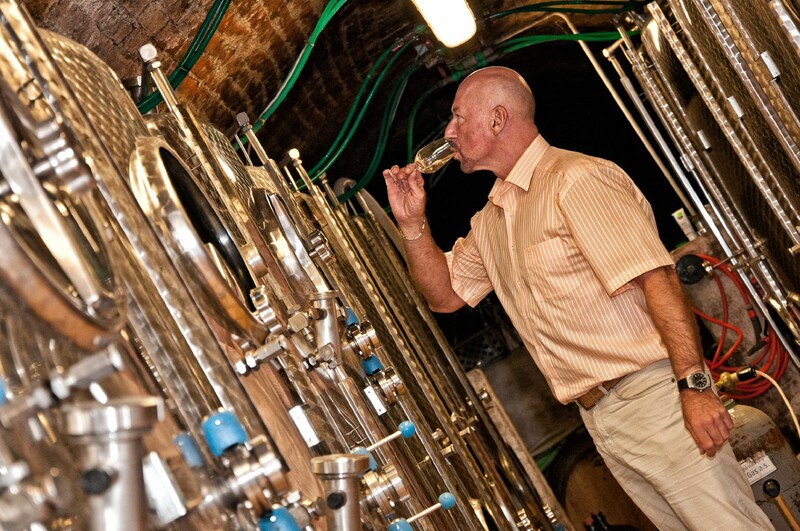 In the manufacture we use the method of controlled fermentation. Part of the batch yeast at low temperatures with use of the cultural French yeast. These procedures have once again been linked to improved sensory perceptions of wine, a beautiful expressive bouquet and taste. The second batch fermented at higher temperatures, thereby creating a higher glycerol content, which then contributes to the fullness and roundness of the wine. The method of controlled fermentation further allows you to regulate the amount of alcohol and residual sugar retained in the wine. According to the amount of residual /grape/ sugar, which didn't turn to alcohol with method of controlled stopping of fermentation , and because of the ratio of acids wine is classified as dry, semi-dry, semisweet or sweet. These aspects of the ,,Peasant wines,, without the use of the cultural yeast and controlled fermentation are missing. In the process of maturation and production of wine, wine is controlled many times by chemical analysis. After completion of the production process, as already mentioned, subject is subjected to the final approval of the State agriculture and food inspection authority and approved by a tasting commission. Our wines are therefore clearly guaranteed grapes origin. Wines are officially approved as corresponding to that adjective, after being analysed in certified laboratories, which certify the accuracy of all data and excludes the absence of adverse, or banned additives, such as e.g. high content of sulfur, potassium sorbate (a preservative used in imported wines) or the addition of rapeseed sugar etc. They are also approved by the sensors, therefore, not only chemically, but also by flavor and aroma corresponding to the special attributes of the given variety. This approval table, the earth and the table - wine by the glass in wine shops are not subject to. In the case of table wines – twisted wine in wine shops, in addition, the separation of sulfur is not carefully controlled. Claret is pleasantly drinkable, refreshing wine of distinctive taste of a pinkish color, which of its qualities would cover the claims of the broad masses of consumers. Although in the Czech republic clarets are gaining their lovers rather in recent years, its production has a long tradition. The largest producer is in France. It's not definitely a mixture of red and white wine, but one of the most costly ways of making wine from red grapes. This is the identical way, which is used in the production of Champagne, with the difference, that Champagne keep on fermenting in the bottle. The grapes are collected in baskets, so as not to damage the husks. Losses during pressing are large, since the grapes can be printed, just until it begins to flow darker coloured juice and then throw away. Unlike the production of rosé wine, when the grapes ground and further may be used in the production of classic red wines. After that with the must be treated as in the production of white wine. But the result is well worth it. To the protection of the environment requires a meaningful consistency between the biological, technical and chemical measures,not least the willingness to take certain risks associated with this partnership with nature. Shortly we can say that the concept of integrated production of grapes and wine is probably the closest to concepts such as ecological cultivation, or organic wine. The concept of "Integrated production" has for the cultivation of vine and production of wines fixed rules, paying internationally, the Association of integrated production. The basic aim of these practices in viticulture is the minimization or complete exclusion of the use of fertilizers and chemical pesticides, minimizing the use of fossil energy. On the basis of the holistic way of thinking IP focuses comprehensively on an agroecosystem and is focused on agricultural enterprise as a whole.